Found one file extension association related to SBaGen and 1 file format developed specifically for use with SBaGen. 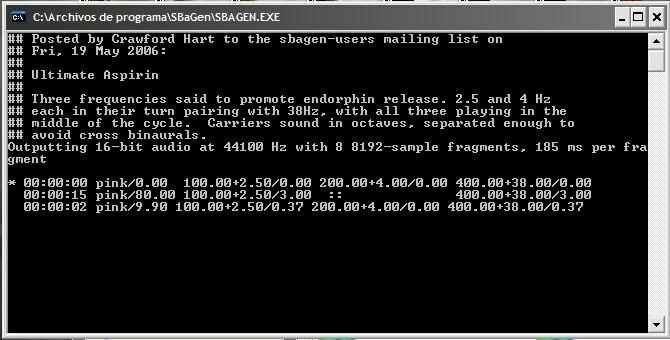 SBAGEN is utility, released as free software for Linux, Windows, DOS and Mac OS X, that generates binaural tones in real-time according to a 24-hour programmed sequence read from a file. It can also be used to play a sequence on demand, rather than according to the clock, or to write a WAV file for playing later. Pink noise, MP3 and Ogg files (since version 1.2.0) may also be mixed with the binaural beats to provide background sounds. (Two files of randomly-looping river sounds are provided from version 1.4.0 onwards). This tool is ideal for anyone who wishes to experiment with these techniques and do research into this for themselves. If you need more information please contact the developers of SBaGen, or check out their product website.